Patrick and Adam Riske turn on their heart lights. Love the podcast guys! I thought it was really heart felt. Is it bad that I've seen Mac and Me and Richie Rich, but never ET? You should probably rectify that asap. I'm a fan of all the shows, but I think this one is one of your best. Riske always bringing the heart! I can't say enough how much I love the way you guys talk about movies you don't like. I work part-time at a movie rental store (yes some still exist) and I've found the only two words most everyone uses to describe movies they don't like is "stupid" and "cheesy". It really drives me insane. So way to be classy and intellectual! I'm more in Adam's position where I've never been a big fan of this movie. I didn't even like it as a kid. I haven't seen it in years, so I don't even remember why, so I'll absolutely revisit it! I work in a bookstore, and I hear the same thing, the reactions are either it was beautiful(which is a werid way of describing something as good), stupid/terrible or too werid. Drives me nuts, it is only a surface reaction. But Patrick and Adam bring their A game again. I love the language and the intellect they bring. As does everyone else on this site. Just rewatched it. Kid version of myself was wrong. This is a really special movie. I give you guys props because this movie is tough to critique. Especially if you saw it as a kid. I'm actually the same with Jurassic Park as Adam is with this movie. I should really love it but I just think it's pretty good. My kids were terrified of ET when they first saw it. We had an ET stuffed animal and my daughter kept throwing it in the garbage. I don't know how other people feel but I loved that this podcast was almost 2 hours long. In my opinion, the long the better. I watched this movie for the first time in order to listen to the podcast (one of the many embarrassing omissions in my film viewing history). Although I happened to love it, I understand where Adam's coming from. There are so many "I can't believe you've never seen that movie" movies that I haven't watched specifically because they are such an institution and I'm scared of not liking because it will make me wonder if there's something inside of me that's broken. I didn't see the oppresiveness/conformity of suburbia that Adam mentioned, maybe just because I grew up in So Cal and have been to a lot of neighborhoods like that one. To me, they just look like any other sun-bleached suburb in the Valley. I saw it more as designed to appeal to kids growing up in small communities, that Elliott is a stand-in for all kids from ordinary places. I'm glad Patrick singled out that scene with Peter Coyote. It's one of my favorites as well. There's so much about this movie (and Spielberg) in that one scene. I don't know if I've changed recently or you guys have altered something but your last few podcasts have been brilliant, this one especially. The way you talk about your feelings towards a film and film in general and how they make you feel are so relatable that I'm almost nodding along in agreement. Fantastic work guys. Appreciate it. Don't worry Adam, I'm right there with you watching all the summer movies. Of course that's mostly for work purposes and I don't have to come up with anything interesting to say about them. One of my desert island movies. Thanks for discussing this beauty. As always, a great, measured and rational podcast. I'm somewhat tempted to watch the 20th anniversary version with all the changes Spielberg made (and later regretted and as far as I know didn't release on blu-ray). I never saw it at the time but I remember the controversy, particularly over the guns being digitally replaced with walkie-talkies. Great show fellas, really. I was always luke warm to ET as a Spielberg lover. It scared me as a kid (but i still watched it) but I never really gave it too much attention afterwards. It wasn't until two summers ago that a local theater was doing a summer run of kids movies that I went and saw it again for the first time as an adult. All the films were animated except ET so I went to this one and I had my mind blown at how much I loved it and and how much it spoke to me as a film that was just magical. I cried so hard, as most of the other adults (who were all probably parents except me). On another note, I too laughed really hard at the flare gun scene in the Sandler flick. I think it was the way the people jumped off the boat and Sandler's honest reaction and laugh. Ah! I love the part about your daughter! So cute. I wanted to say- the first time I remember ever seeing my dad cry was on an airplane ride when he was watching October Sky. I probably cried just from watching him- but gotta say, I loved and respected him more somehow for that. Somehow it made him seem more "knowable". movies growing up. Actually as an adult I'm still trying to develop more empathy for male characters. I know it's really important, I'm trying. I love E.T but exactly like Patrick I only discovered how great it was some five years ago and I was pretty indifferent towards it as a child. 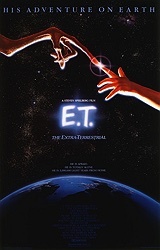 I think one of the magic things about Spielberg's films, E.T especially, is that they resonate differently to you depending on if you're a child or an adult. I can appreciate the craft of Jurassic Park as an adult, but I can never relive the aweseomeness I felt for the movie as a kid. When it comes to E.T. I think most adults care more for it than kids. From my experience (only), kids are either fairly indifferent to E.T. or totally scared by it. But since we as adults can read the movie, we can also be affected by it and I think what moves us is the inescapable fact that our childhood is over, even long gone. In a way, our childhood is like a movie. It had a beginning, middle and an end, it always existed as a fantasy, something beyond reality, and all we can do now that it's over is to replay it. Kids do not necessarily have a very clear entry point to the movie, because it is too much about them (weirdly enough) - it's observing children much more than it's embodying them. A movie like Free Willy (as it were) is in a way much more kid-friendly because it bothers with making the kid a character on the same level as an adult character in any other movie. Elliot is just a kid, or the kid personified, any child, and ET himself is just a perfect magical object. The movie is not about the story or the specific characters, it's about the big ideas and the core emotions in themselves. I don't necessarily mean this as a comment to Riske but if you're not feeling the movie as an adult, maybe you're either not accepting the fact that your childhood is over (and/or even that we'll all die someday) or maybe you never gave it too much thought to begin with. Not saying that to be smart, but because its such a strong notion to me and the thing in E.T. that resonates so painfully in me. To me, E.T. became a heartbreaking and beautiful film not until I could clearly identify my childhood as dead, and the child I was dead, not existing anywhere in or around me anymore and never to come back, and my adulthood a permanent fact. Great podcast, as usual, it made me laugh and want to watch ET and a bunch of other movies. One of the movies it made me want to rewatch was Taika Waititi's Boy. I have only very foggy memories of ET as a kid, for whatever reason I never latched onto it. So Taika's multiple bare-faced references to ET always left me somewhat puzzled. It now makes so much more sense, the two movies seem to share a lot in common thematically. The wonders and terrors of childhood, parental issues, etc...both are painfully heartfelt and have that natural feeling humor, Patrick described. There aren't too many move that can make me both laugh and cry. I knew Boy was one and now I know ET is as well. Its probably weird that I spent more time talking about Boy than ET, but, oh well. I think Patrick's right that the focus on Spielberg's "male geek teen"-friendly flicks has maybe overshadowed E.T. just a bit. I also could imagine, over in the world of non-movie-nerd parents just seeking out good fare for their kids, that maybe the Pixar pantheon and a handful of other kids' movies have filled some of the space of an E.T.? That is, there's a range of choices of kids' movies that are emotionally compelling both for kids and the parents watching, really *about* some big and important things, and of course just plain entertaining. I still think E.T. 's a cut above nearly everything else out there, but maybe it's not as desperately essential to fill a huge obvious gap. So, setting aside the geeks - - - I wonder where it sits in lists aimed at parents picking a "classic for the kids" or whatever?